she knows what it's like to be torn down. Hi Loves! How was your weekend? Mine was great.. Didn't do much. On Saturday, I went to Richmond, VA to visit some friends. Richmond is such a beautiful city and of course I took lots of pics, which I'll share in a future blog post. Anyway, this post is about what I wore to Day One of All Things Ankara Fashion Week DC / ATAFWDC (See Day Two Here and Day Three Here). Today is your lucky day, you get two pattern reviews in one blog post. :) This outfit has been on my "To-Sew List" all summer, but for some reason, I kept putting it off. So when I was asked to be the Blogger Affiliate for ATAFWDC and was ask to wear ankara each day of the event, I moved the outfit up my list. The first night of ATAFWDC was a meet and greet / networking / cocktail event, so I wanted something girly yet professional. The top (M6558) gave me that sassy and lively look, while the knee length pencil skirt (S1559) gave a professional look. Pattern Description: Pullover tops have elasticized neck/raised (seamed) waist, and narrow hem. Were the instructions easy to follow? Very easy. This is a great pattern for beginners. What did you particularly like or dislike about the pattern? Love that the pattern didn't have a lot of pieces to cut out and it was easy to put together. I also love the style. Pattern alterations or any design changes you made: Didn't change a thing with this pattern. Everything about it was perfect. Would you sew it again? Would you recommend it to others? Yes! I can't wait to make it into a fun midi dress for next summer. Pattern Description: Misses' classic knee length pencil skirt. Were the instructions easy to follow? Yes, the instructions were easy, but I didn't really follow them. This is a perfect pattern for beginners. What did you particularly like or dislike about the pattern? I like the simplicity of the pattern. The split starts at the perfect place, it wasn't too high up in the skirt. Pattern alterations or any design changes you made: The only changes I made were to the bottom of the skirt. I took in about 1 1/2 inches on each side at the bottom to make the skirt come in a little instead of it being straight. 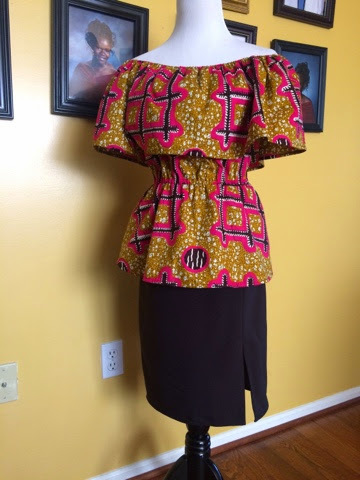 This gave the skirt just a little curve from the hips to the hem. Check out my fro length.. My hair is growing pretty fast and I'm loving it. Nice outfit. I love the fabric. Ya. You look so good and happy. I am loving your natural hair too. Your prints are fabulous. It was great being your class mate at Sassy Sewer. Aww thank you so much, Vicki!! !